Just when you thought that you could relax with your record collection along comes another contender with a substantial range of serious-looking turntables. What's surprising, however, is that despite having UK representation for some time, it's only in the last few months that we have discovered Acoustic Signature, of which the Manfred Mk II is one of the German company's more affordable offerings. It comes with an outboard power supply and a free-standing motor and the diamond polished platter sets it apart from an increasingly large crowd of competitors at this level, as does switchable speed control. It can be supplied with any Rega tonearm, or a base to the arm of your choice. 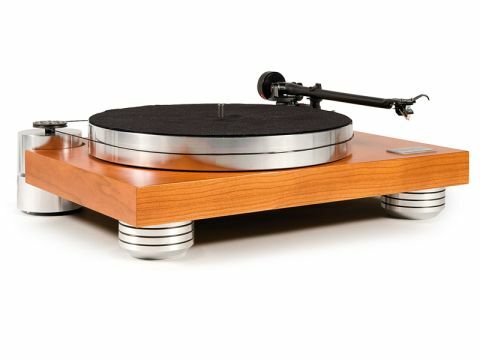 This is a superbly put together turntable; everything about it oozes quality, from the real wood veneer finish to the beautifully polished platter. There are not many examples of solid aluminium platters in the sub-£2,000 arena anymore. Perhaps because it's an expensive material to finish well and requires some means of damping to stop ringing. The Acoustic Signature has a large damping pad on the underside of the platter for this very purpose. The platter itself is 34mm thick and weighs six kilos. Acoustic Signature has used sintered bronze inserts that have been infused with lubricant in the bearing housing, so that you don't need to add oil which is a boon if you have to repack the deck at any time. The thrust pad that supports the spindle is made of Tidorfolon, a material that Acoustic Signature developed specifically for the purpose. An alloy of vanadium, ferrite, Teflon and titanium, Tidorfolon is a relatively soft material which mates with a hard tungsten carbide ball at the tip of the bearing shaft or axle. The plinth is 38mm thick and made of veneered MDF. It sits on three large aluminium feet, which are adjustable for height using a metal button in the centre. The Manfred turntables shown on the Acoustic Signature website appear to have spikes in the feet which are no longer supplied, but are available on request. We particularly like the way that the cleanly machined motor housing fits into a circular cut-out in the corner of the plinth. It looks as if it's integrated and contrasts rather well with the wood veneer. The motor has a large drilled-out pulley that runs at a slower speed than usual. When it's started up, it appears to run anti-clockwise while it brings the platter up to speed via a square section rubber drive belt. The standard arm mount for this turntable is an aluminium one for Rega tonearms, like the RB251 fitted here, but the company can supply alternative plates to suit any nine-inch arm. Power is supplied by a separate S Alpha motor controller; this converts AC mains to DC current and has a precision oscillator to deliver a 12-volt AC sine wave to the motor. This supply is said to be impervious to fluctuations in the mains and to isolate the motor from any noise. The S Alpha also provides switchable speed change, but does not transform the mains onboard; instead there is a separate inline transformer with an IEC inlet. This means you have three elements connected together to produce a motor that spins at the desired speed. As it turns out, it spins very slightly faster than 33.3rpm (according to our strobe disc) probably to offset stylus drag. In terms of build and finish, the Manfred is in the premier league of turntables at its price point. Separate power supplies are not common at this level and, as already mentioned, metal platters are pretty rare, too. Competitors such as Michell have fully suspended models for rather less, however, and the Manfred's apparent lack of methods to keep resonance at bay will be a concern for anyone with a wooden floor. There is nothing in the way of tonearm damping, either (Townshend and Well Tempered both have features on turntables at this price which seek to quell resonance in the tonearm so that the cartridge can do a better job). The only resonances that the design addresses are those in the platter, where a damping pad below and felt mat above attempt to minimise any problems. The bearing is clearly interesting as Michell has developed a self-lubricating inverted bearing, but few individual companies have created a material like Tidorfolon specifically for a turntable. Thanks to this proprietary technology, the bearing design is said to reach optimum performance within 15 minutes and to operate flawlessly for at least ten years, the period for which it is guaranteed. Another nice touch is that the inner part of the arm plate can be raised and thus used to adjusted VTA (vertical tracking angle) with Rega arms that otherwise require spacers for this purpose. The Manfred, combined with an RB251 arm and a Dynavector DV-20X2L moving coil, produces a clean and taut sound that digs deep into the mix for the fine details and responds well to better recordings. It might look a bit similar to an LP12, but it has a rather more precise and grounded sound. The RB251 also seems like a rather basic arm for such a well, put-together turntable and its relatively low mass counterweight is not perfect for cartridges like the Dynavector. Nonetheless, the results are pretty entertaining and revealing, thanks to its ability to resolve subtleties in the context of decent timing. It's not as on-the-ball as some other turntables at this level, but it's no slouch either. When it comes to playing different types of music, it has the ability to distinguish between the instruments lower down in the mix, as well as those that take centre stage. Voices are clean and open, too, with good image solidity. But even if this clear-cut presentation is a little short on romance by vinyl standards, the Manfred Mk II still has an honest, almost clinical sound that detail enthusiasts will appreciate. What most appeals is the stability of the sound; it might not be as thrilling as some other designs, but its imaging and pacing are extremely consistent, benefitting albums like Keith Jarrett's Köln Concert with its repetitive motifs on solo piano. The Manfred Mk II has a lot going for it in terms of both detail and resolution. Its only shortcoming is a lack of spark and it doesn't always resolve the terra firma of recordings enough to convince you that they are happening right there in the room. It's likely that a better tonearm would help in this respect, but we have not found the RB251 wanting in the past; it may lack refinement, but is not short on charm. All-in-all, the Manfred looks great, but doesn't capture the imagination quite as well as the best in class.